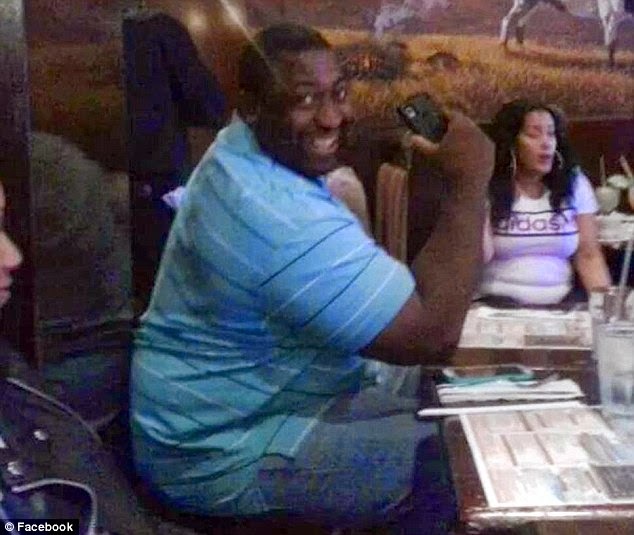 The widow of an asthmatic man who died after New York City police put him in a chokehold has spoken of her horror at seeing a video of the arrest. 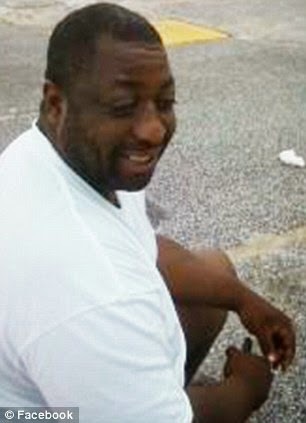 Esaw Garner said she was deeply upset by the footage that showed police trying to arrest her husband, Eric, in Staten Island on Thursday. The mother of his six children collapsed in tears at a press conference on Saturday, the day after it was revealed that two of the men involved in the fatal arrest have been put on desk duty. Officer Daniel Pantaleo and Officer Justin Damico have been put on desk duty while an investigation is carried out into the arrest. The officer believed to have used the chokehold, who has not yet been identified, may lose his job, a law enforcement source said. 'It violates protocol. It violates a direct rule which is never to put somebody in a choke hold,' the unidentified source told the New York Post. 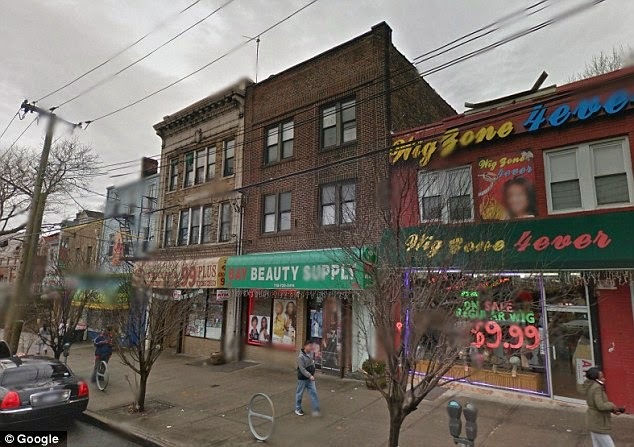 It is alleged that the police put Garner in a chokehold - a maneuver barred under their practice code - when they tried to arrest him over claims he was selling bootleg cigarettes. 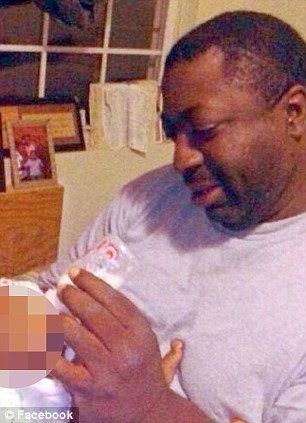 Garner's wife watched footage of the arrest, and her 43-year-old husband's final moments on a sidewalk, on Friday. 'They killed him. They choked him and took him down and I could hear him screaming that he couldn’t breathe,' she told the Daily News, which has an exclusive copy of the film. The 46-year-old had to be comforted by the Rev Al Sharpton when she appeared at a press conference by the National Action Network on Saturday. 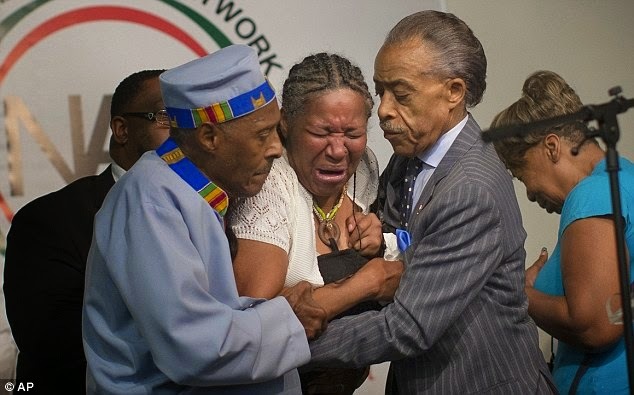 She sobbed uncontrollably as Sharpton described the circumstances of her husband's death. 'The issue is not if one was selling [untaxed] cigarettes, the issue is that an unarmed man was subjected to a chokehold and the result is he is no longer with us,' Sharpton said. 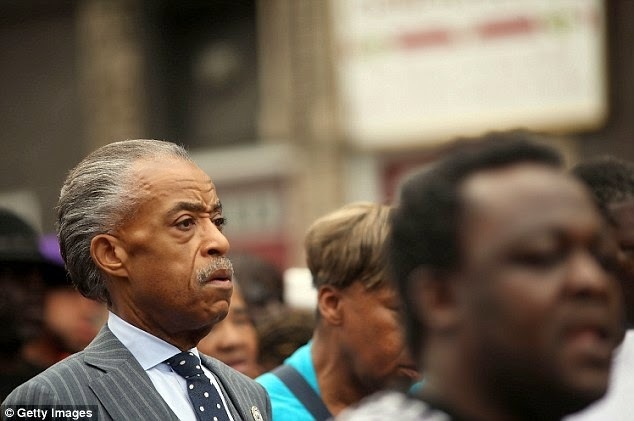 On Saturday afternoon, Sharpton joined the family on a peaceful demonstration through Staten Island, to protest the circumstances of Garner's death. In the video Garner, who was not armed, is heard denying that he has been involved in illegal activity when a plain clothes police officer stopped him. 'Every time you see me you want to mess with me. I’m tired of it. It stops today!' he is heard saying. When he is put on the ground by five cops while being handcuffed, Garner was yelling out that he couldn't breathe, according to several witnesses who watched the arrest. 'They jumped him and they were choking him. He was foaming at the mouth. And that's it. He was done,' Ramsey Orta, who took the video, told The Daily News. New York Mayor Bill de Blasio has postponed his trip to Italy to ensure the investigation gets underway. In a statement released Friday, he extended his sympathy to the victim's family, and promised a 'full and thorough investigation'. 'We have a responsibility to keep every New Yorker safe, and that includes when individuals are in custody of the NYPD,' de Blasio said. After the incident, posters saying 'no justice, no peace' 'and Another innocent black man has been killed by police brutality. The NYPD must be stopped!' appeared in the area.